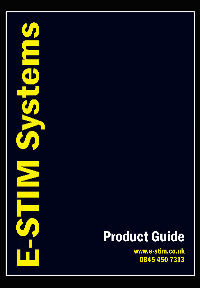 Thank you : E-Stim Systems | EStim | Electrostim | Electrosex | Electroplay, Personal electro stimulation with a professional touch. A copy of our latest brochure will be in the post to you in the next couple of days. Please be assured we always send under plain cover, in packages marked private and confidential. Once posted your mailing address is removed from our system and no more posted mailings will be sent.